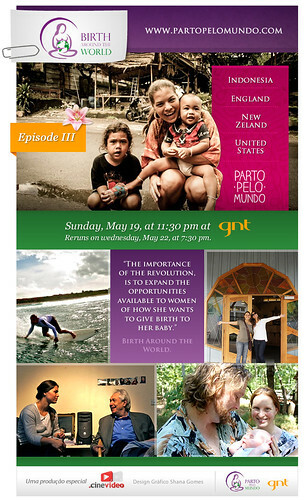 Revolution, our third episode will be on tv next sunday, May 19 11:30pm (brazilian time) at GNT. We have special interviews with the doctor and researcher Michel Odent, Ina May, Janet Balaskasand and Robin Lim! Passing by Indonesia, United States, England and New Zealand we’ll visit places that are living a revolution. Let’s see inspiring realities and who is behind them. You have to presss the full screen mode.Revolução vai ao ar no 19 de maio, às 23h3min na GNT. Vai contar com entrevistas super especiais do médico e pesquisador Michel Odent, Ina May, Janet Balaskas e Robin Lim! Passando pela Indonésia, Estados Unidos, Inglaterra e Nova Zelândia vamos conhecer lugares que passaram por revoluções. Vamos ver realidades que inspiram e quem está por trás delas! Esta lindo!! !